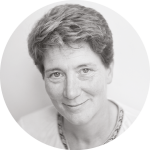 Senior Lecturer in English Language and Linguistics at the University of Westminster and has recently published Gender, Power and Political Speech: Women and Language in the 2015 UK General Election (with Deborah Cameron). One of the more notable themes of the GE2017 campaign was Theresa May’s reluctance to engage in spontaneous public exchanges. Immediately after the General Election was called she announced that she would not take part in any ‘head-to head’ election debates and her subsequent public appearances were reportedly strictly managed to ensure that she was surrounded by Conservative Party supporters and not exposed to spontaneous questions. Theresa May appears to be more reliant on pre-planning than other political leaders. Her Prime Minister’s Question Time (PMQs) performances show a hyper-controlled style and her responses seem prepared in advance. Although she cannot predict Corbyn’s weekly questions in PMQs, she can prepare her stock rhetorical tricolons or ‘sets of three’ and adversarial, ad hominem ‘soundbites’, that have become characteristic of these exchanges (such as: ‘He can lead a protest, I’m leading a country’). In contrast, it is impossible to predict any aspect of the spontaneous ‘walkabout’ public exchanges, and these prepared catch-phrases are unsuitable for such interpersonal conversations. 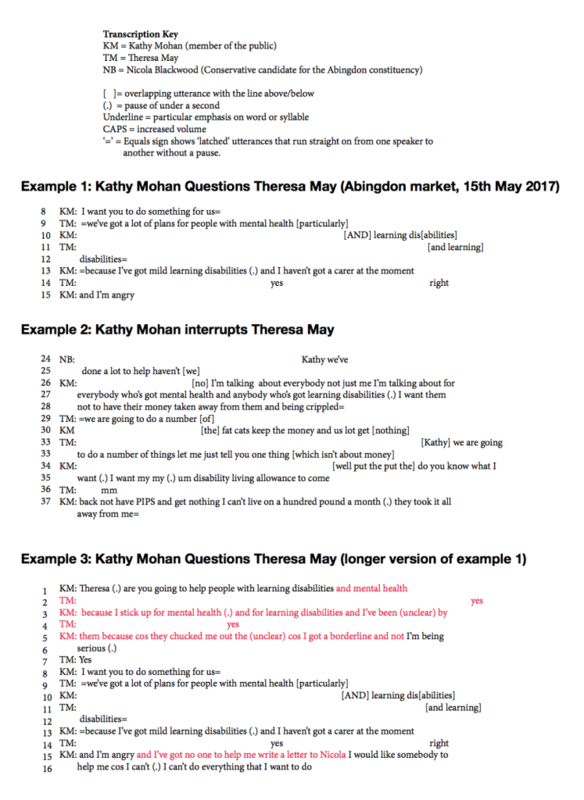 Here I use a discourse analytic approach to investigate one particular event where the guard slipped: an encounter with Kathy Mohan, a member of the electorate who questioned Theresa May in Abingdon market about the loss of her Disability Living Allowance (DLA). I identify the particular interactional difficulties that these events presented for Theresa May and show how all politicians should be cautious of these events as they are susceptible to contested representations in the media. The first and most obvious characteristic of spontaneous public events is exactly that – politicians cannot prepare for them in advance and so the topic, tone, and detail of the question can take them by surprise. Theresa May appears to be more reliant on pre-planning than other political leaders. Her Prime Minister’s Question Time (PMQs) performances show a hyper-controlled style and her responses seem prepared in advance. 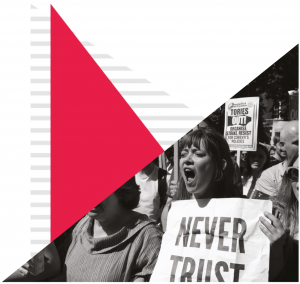 Although she cannot predict Corbyn’s weekly questions in PMQs, she can prepare her stock rhetorical tricolons or ‘sets of three’ and adversarial, ad hominem ‘soundbites’, that have become characteristic of these exchanges (such as: ‘He can lead a protest, I’m leading a country’). In contrast, it is impossible to predict any aspect of the spontaneous ‘walkabout’ public exchanges, and these prepared catch-phrases are unsuitable for such interpersonal conversations. Kathy Mohan starts the conversation with the direct question ‘Are you going to help people with learning disabilities?’, followed by ‘I want you to do something for us’ (see Example 1, line 8). May’s initial response (‘We’ve got a lot of plans…’) evades the demand and attempts to provide a general response, aligning to her manifesto. However, Mohan interrupts May to correct her (line 10) in a way that shows no regard for May’s status as PM. This pattern is repeated throughout the conversation and Mohan interrupts May nine times during the exchange (see Example 2 lines 21, 25, and 28). May is confronted by a self-confessed ‘angry’ voter who directly contradicts her and underlines the personal impact of the loss of the DLA (see Example 2 lines 33-37). May attends to Mohan’s questions, does not directly interrupt her and gives appropriate ‘minimal responses’ which indicate attentive listening (for example the ‘yes’ and ‘right’ in Example 1, line 14), but she does not directly engage with Mohan’s demands or her personal circumstances. Responding to the public voice of the voter rather than an opposing politician in a more formal forum is therefore complex: May needs to manage affect and politely attune to the individual ‘face’ or politeness needs of the questioner while at the same time attending to the impressions of the immediate and overhearing media audiences. This is more difficult than responding to questions from political opponents in political or media events (such as televised election debates or interviews), because politicians can completely disregard the face needs of their interlocuters and only attend to the immediate and ‘overhearing audience’ of the broadcast or social media. Interestingly, in the political campaigns of GE2017 that were rife with political insults, slurs and fake news from different directions, one of the media ‘takeaway’ messages from this interaction was that Theresa May ‘did not know the difference between ‘learning disabilities’ and ‘mental health’’. Example one suggests that May assumes Mohan has ‘mental health’ issues (line 9), and that Mohan corrects her (line 10). However, this transcript is taken from heavily edited versions of the conversation (for example from The Guardian and BBC news websites). A longer version is represented in Example 3 (the added information is highlighted in red and it is taken from the Mirror and Sky News websites). In the second, longer version of the conversation it is clear that Mohan uses the phrase ‘learning difficulties and mental health’ more than once to describe the situation, which possibly explains why May uses this phrase herself. May also defends her use of the term ‘mental health’ in this conversation when she appears on BBC Question Time later in the election campaign. Whether May does or does not conflate these two terms is debatable but the differences between the two versions of the video are startling. Certainly, the record of these spontaneous public events is highly unreliable given that there is no recourse to a definitive version of the ‘real’ conversation. Therefore, it seems that politicians have every reason to be wary of this type of political interaction as it is particularly susceptible to alternative media representations.